This morning JC members have been sending messages about jewelry cleaning. They value patina. One member mentioned damage done to a piece by using Tarn-X. I had to add my thoughts. I know I am new to selling and identifying jewelry. I have however collected costume jewelry, evening purses and other treasures with my Mom for decades. I like to wear and use my things. I struggled for years, trying to find a method to clean silver. In most cases I have been able to use jewelry polishing cloths and in some cases polish to get my pieces looking acceptable. I prefer the piece look newer and the sheen of silver be restored. However, now that I have a web store, I am aware many collectors value “patina”. Mesh jewelry and evening purses cause me the most difficulty. I cleaned two pieces I discussed in my earlier posts using two different methods. Using polish is problematic. Even when the polish gets into the mesh, it doesn’t really restore the luster. 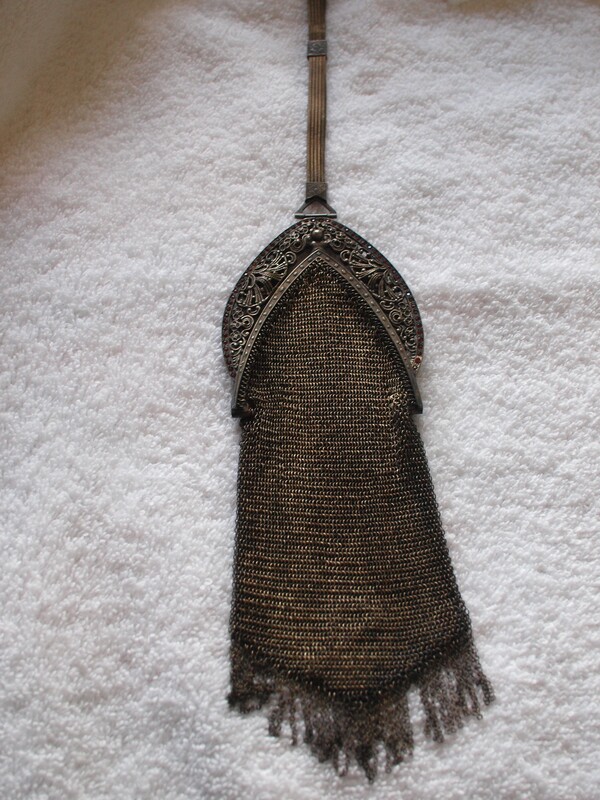 Most of all the look of a piece I cleaned using polish and polishing clothes (the drawstring silver mesh bag) is uneven. Some areas are cleaned to a silver luster and other areas are still dark. I recently got advice from my local jeweler. I tried her method. Not one of the purses discussed here is sterling. They are all antique. 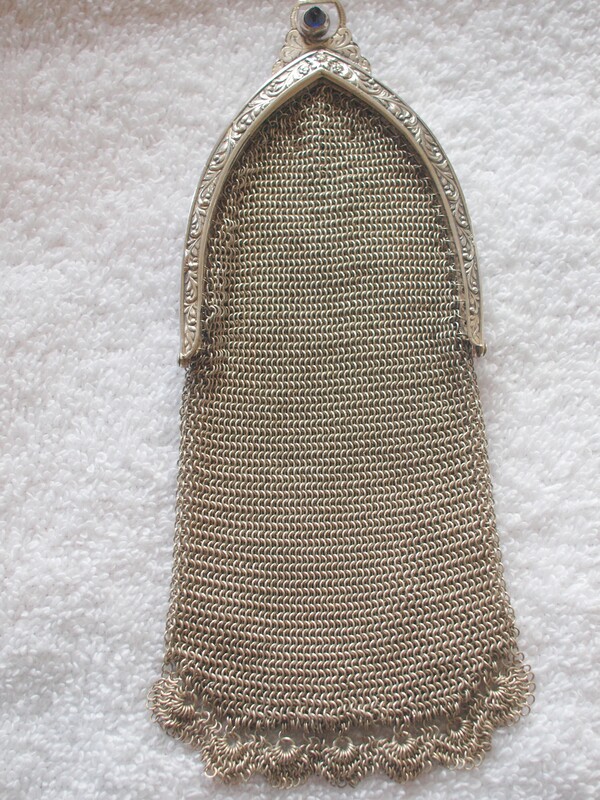 The draw-string mesh purse is German silver. As stated above, I cleaned and cleaned the drawstring purse with a cloth and paste. I am not happy with the result. Some of the mesh is one hue of silver and some of the mesh is another. I followed Jeweler Kathy’s instructions on a mesh purse marked ALPACCA, which is made in Germany. The third purse remains dirty. 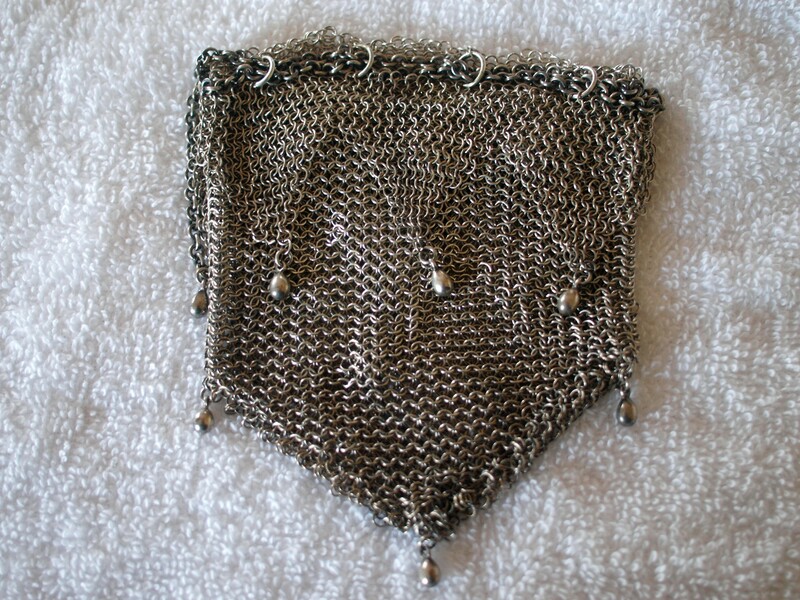 A JC member told me the silver in ALPACCA or ALPACA purses is an alloy of about 2% silver. I also used the method my jeweler – Kathy – told me she uses, on a piece of sterling Silver jewelry. I am happy with my results. You might not like the look. The look is bright and shiny. Not what I am hearing most collectors prefer. I have not taken a photo of the jewelry piece. Jeweler Kathy’s method shocked me. Jeweler (And gemologist) Kathy uses Tarn-X. I used Tarn-X on a piece of silver years ago and felt I had ruined the silver. The result was dull and awful. I could not get it restored. I polished with paste with no good results. However, Jeweler Kathy told me she uses this method on her estate pieces. The jewelry in her store is lovely. So I tried it. I followed her directions. I dipped the piece BRIEFLY in Tarn-X. I immediately took it out and rinsed and rinsed and rinsed in water. Jeweler Kathy warned, never leave anything in Tarn-X and make sure you rinse it extremely well. In my opinion the piece looks great. I know there will be many collectors who will never use this method. I would love to hear what you use for mesh. Personally, I am surprised and happy with the look of my very old vintage purse. I have a silver mesh jewelry collar. I intend to use Tarn-X to clean it. Bernie berniesvintage.com. My husband Bruce Gainer and I are owners of 209 and S106 at Kalanikai. We hope to chat with other owners and residents to learn more about our complex and our association. We hope Kalanikaichat enhances communication. Who knows we may make some new friends.. This entry was posted in Costume Jewelry, Evening Purses, Silver ID & Cleaning, Vintage Collectibles, Vintage Silver and tagged Bling, Cleaning DIRTY Silver, Identify Sterling Silver, Tarn-X, Vintage Jewelry, Vintage Purses. Bookmark the permalink.